The Mekong Region has come to represent many of the important water governance challenges faced more broadly by the mainland Southeast Asian region. 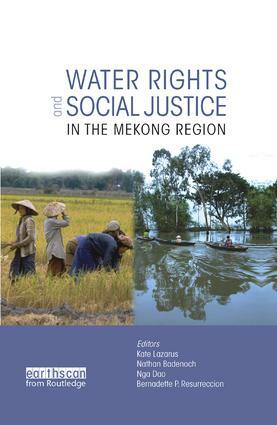 This book focuses on the complex nature of water rights and social justice in the Mekong region. The chapters delve into the diverse social, political and cultural dynamics that shape the various realities and scales of water governance in the region, in an effort to bring to the forefront some of the local nuances required in the formulation of a larger vision of justice in water governance. It is hoped that this contextualized analysis will deepen our understanding of the potential of, and constraints, on water rights in the region, particularly in relation to the need to realize social justice. The authors show how vitally important it is that water governance is democratized to allow a more equitable sharing of water resources and counteract the pressures of economic growth that may pose risks to social welfare and environmental sustainability. Kate M. Lazarus is a water governance specialist with the Mekong Program on Water Environment and Resilience (M-POWER) and the Challenge Program on Water and Food (CPWF), Lao PDR. Nathan Badenoch is an Associate Professor at Kyoto University's Center for Southeast Asian Studies, Japan. Nga Dao is co-founder and director of the Center for Water Resources Conservation and Development (WARECOD) in Vietnam and a PhD student in human geography at York University, Canada. Bernadette P. Resurreccion is Associate Professor in Gender & Development Studies, School of Environment, Resources & Development at the Asian Institute of Technology, Thailand.